Hi again, it’s been too long. I’m starting to make a habit of apologizing at the start of each new blog; I think instead of doing that I will just try to update this more often. While you may not have enjoyed my 3,000 word wall text about the New Year last time, you’re sure to enjoy this blog about government debt! And while this blog is very similar to some other posts I’ve written in the past, I think it addresses some important newer information. In a way I will be piling onto an issue and a paper (more specifically) that has already gotten much attention. The Reinhart-Rogoff research paper has been refuted for its macroeconomic theory by Nobel-winning economists and for it’s specific (excel-related) errors by grad students, even Stephen Colbert piled it on eventually. While opinions on the paper vary, no one can dispute it’s significance in framing the debate for policymakers from across the world. Others have already thoroughly refuted the paper’s conclusion, so I won’t try to do this directly. Instead, I would like to look into some of the broader questions that are raised in this paper; specifically, what is the relationship between government indebtedness and the overall health of the economy. To begin, I want to briefly explain the paper’s thesis and how it’s been refuted. In 2010, Carmen Reinhart and Kenneth Rogoff of Harvard authored a paper titled “Growth in a Time of Debt” that argued that after a certain threshold of indebtedness (90% of GDP) a nation’s growth will drop off dramatically. Underlying this claim was a statistic stating that average GDP growth in developed countries with 90% public debt to GDP will see GDP growth of -0.1% on average. The pair refused to release their data to others until a grad student at the University of Massachusetts, Thomas Herndon, was allowed to use it for a term project where he intended to replicate their findings. Instead, he found that their excel spreadsheet had somehow omitted the results of five countries and incorrectly averaged New Zealand’s GDP growth. When those countries are taken into account, particularly Australia (! ), Belgium, Canada, and New Zealand, Thomas found that average growth for countries with 90% debt to GDP was actually 2.2%, a very different result than -0.1%! Now, instead of chest thumping this news that broadly confirms my own interpretation of recent history, I’d like to dig deeper into the broader question raised by the Reinhart-Rogoff paper: what effect does high government debt have on the economy? Both Japan and Spain have received a lot of media coverage lately for their economic circumstances, specifically their indebtedness. 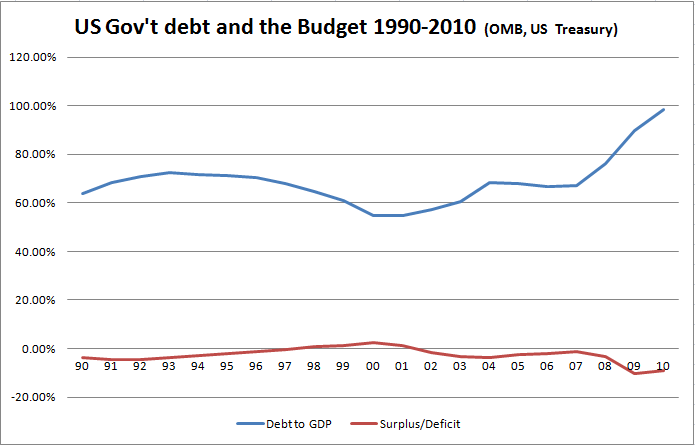 But as you can see in the graphs above, their levels of indebtedness do not correlate to growth with any consistency. 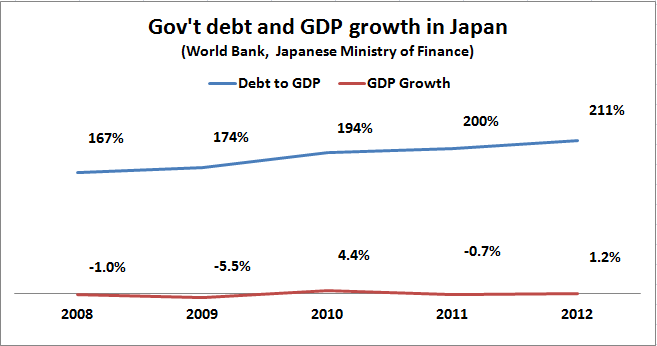 Japan’s level of debt has remained above 100% of GDP since 1998, it’s economy has grown at an average rate of 0.55% annually. While that number looks quite weak (it is), it occurred during: the 1997-8 Asian Financial Crisis, the 2007-8 Global Financial Crisis, and the 2011 Tohoku Earthquake and Tsunami. Even with all of these headwinds the Bank of Japan predicts annual growth to be 2.9% in 2013. While Spain’s pre-crisis growth was higher than Japan’s, its much lower levels of indebtedness have not shielded it from the stagnation being felt throughout much of the Eurozone today. 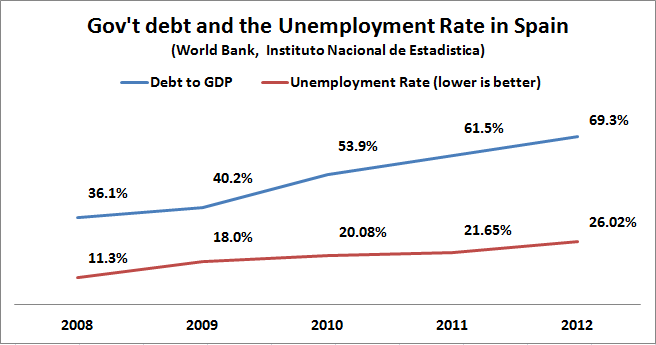 To further illustrate this, lets take a look at another useful economic indicator: unemployment rates and levels of indebtedness. Years of high borrowing costs have done more than just complicate the finances of Spain’s government, it has found its way into the real economy as well. Spain is an example of what can happen when a country’s debt is not denominated in a currency that is controlled by the debtor nation’s central bank. Under normal circumstances (i.e. when a country borrows in a currency it also issues) a central bank has flexibility when it comes to both controlling a nation’s borrowing costs and shielding the economy from its harmful effects. For example, the central bank for the UK (the Bank of England) has used its power to both lower the yield on long-term government bonds (by purchasing them with printed money) and lowering interest rates (0.5% since 2009) to try and boost available credit in the real economy. In addition to these tools, central banks like the Bank of England have also intervened at times to lower their currency’s exchange rates with other countries. Without these options, Spain has instead had to rely on the policies of the central bank for the Euro, the ECB, with limited success. As you can see on the above graph, borrowing costs for Spanish and Italian businesses and the overall lending environment have fallen out of sync with ECB lending rates. The message I want to convey here is not that Spain’s economy is doomed to failure; Spain’s circumstance has actually improved somewhat recently. 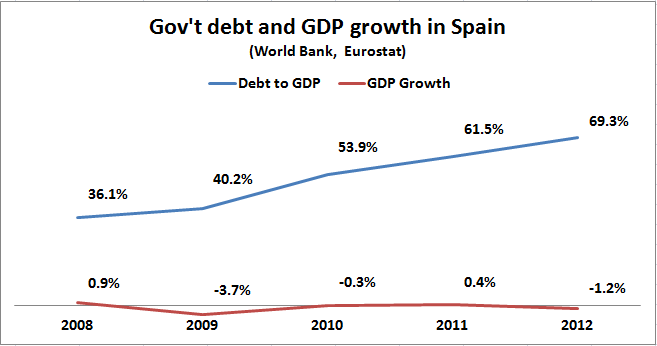 Instead I want to point out Spain’s high borrowing costs had nothing to do it’s government’s debt levels or deficits; before the Global Financial Crisis, Spain ran a budgetary surplus and had relatively little debt. 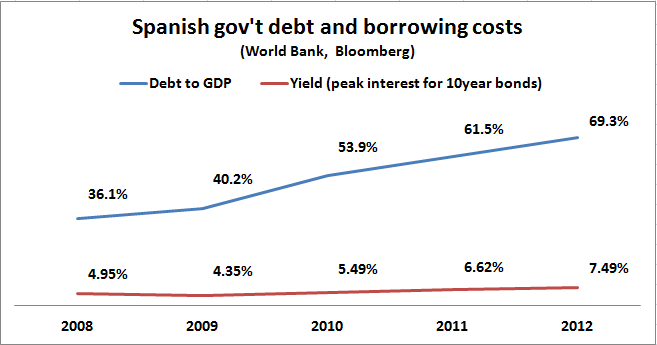 So why has Spain been punished with high borrowing costs while countries with much larger debts (Japan and the US, for example) have not? The answer, as well as a new set of problems, come with control over the currency that debt is denominated in. 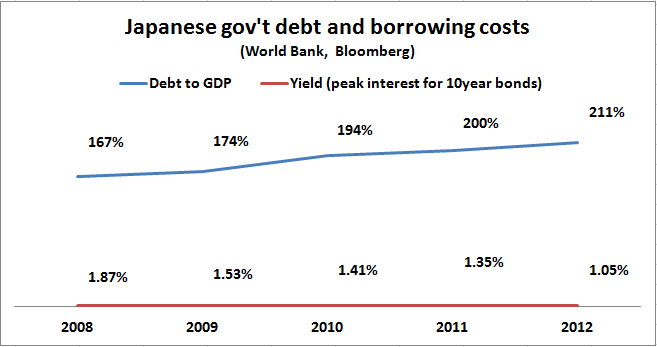 … it seems to me that the Japanese government’s success in holding down its borrowing costs has probably had big negative effects on the economy. Banks that are forced to buy JGBs can’t lend as much to firms, which seems like it would depresses economic activity, holds down growth, and probably contribute to deflation via suppressed wages. Households have been squeezed and squeezed by falling incomes until their savings rates have gone negative, yet they are still earning nothing on their savings. In most countries we don’t think of deflation as a problem, but it can be just as damaging to an economy as inflation. Deflation, which Japan has experienced for most of the past decade, makes private borrowing more expensive, and pushes down consumption and investment over time. This has become a big enough problem that Shinzo Abe has implemented aggressive monetary and fiscal policies that are designed to increase inflation and decrease the value of the Yen, with mostly positive results so far. 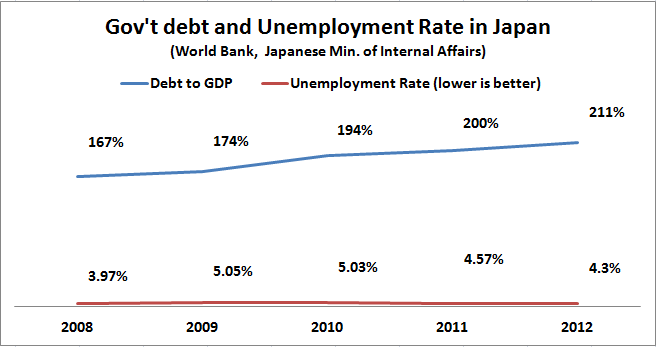 But Japan is unique in this regard: many countries fear the opposite when regarding inflation at a time of high debt. Argentina is a useful example of both the benefits and the pitfalls that come with controlling your own currency. 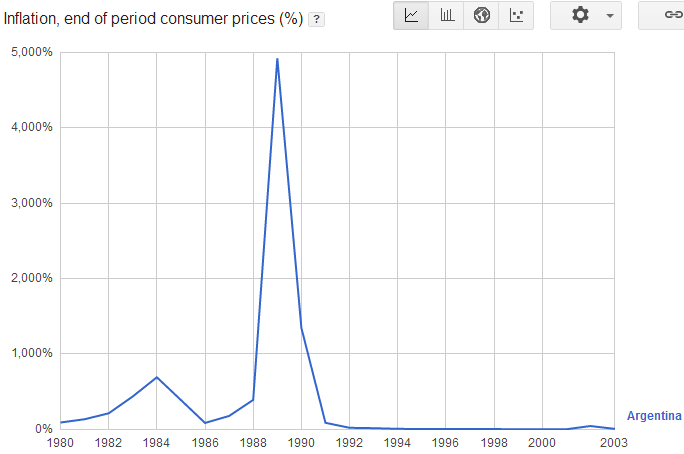 From the 1970s to the early 1990s, Argentina suffered a series of currency shocks and generally high inflation, culminating in a spectacular 5000% annual inflation rate in 1989 (pictured above). That crisis was sufficient enough that Argentina began a currency peg with the US Dollar in 1991; under the new regime, anyone could exchange one Argentine Peso for one US Dollar. To maintain this “convertibility”, the central bank of Argentina had to maintain an equal amount of US Dollars in reserve as there were Pesos in circulation. While this had the positive effect of limiting inflation and increasing foreign investment in Argentina, it had many negative effects as well. By tying the value of the Peso to the USD, Argentina effectively ceded its monetary policy to the US Federal Reserve. In addition to receiving the low inflation of the US Dollar, Argentina experienced the pitfalls of its high value: for the duration of the currency peg (1991-2001) Argentina’s current account (net trade and net investment) was negative. Unemployment started to increase as the currency’s high cost made difficult for businesses to pay living wages while remaining internationally competitive. By 1999, the unemployment rate reached 16% and the economy entered a three-year recession as Pesos and Dollars became scarce. 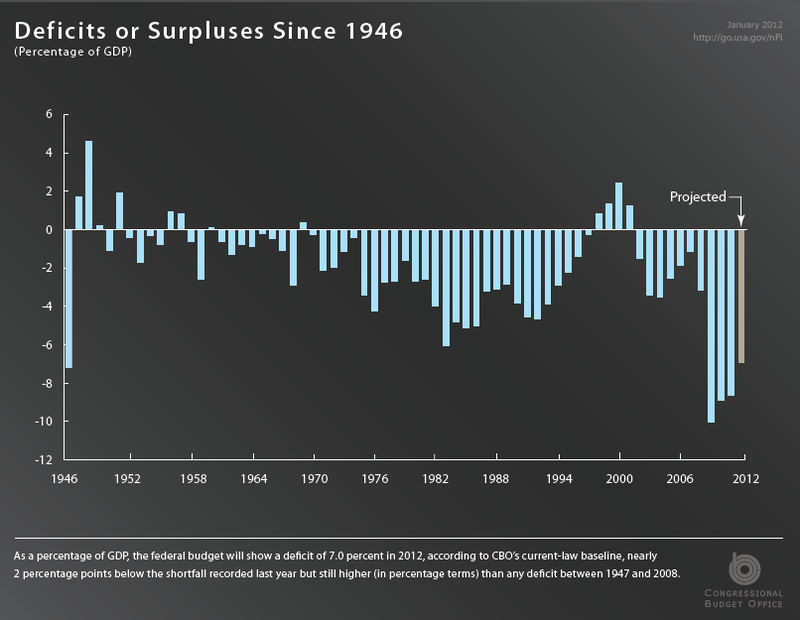 At the same time, the government faced pressure from the IMF to lower its deficit with spending cuts, which it implemented to the detriment of the economy (sound familiar?). 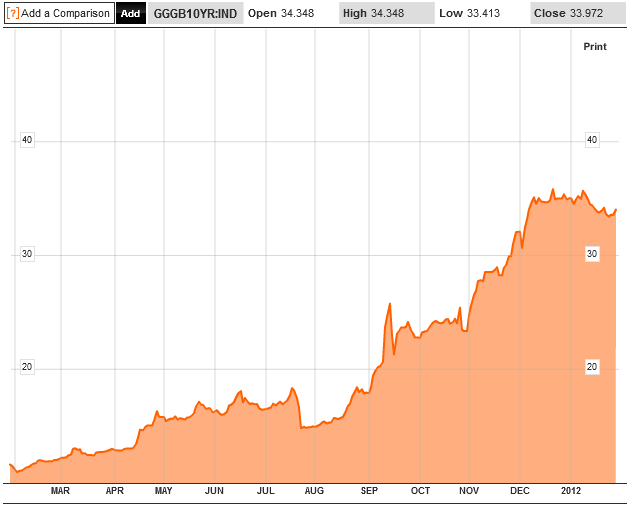 Argentina was forced to borrow at high interest rates before being shut out of bond markets entirely. With debt levels reaching 164% of GDP in 2002, the country defaulted on most of its debt and abandoned the currency peg shortly after. By devaluing its currency and effectively ignoring calls by the IMF for further austerity, Argentina was able to recover from the crisis with average growth above 8% since then. The downside to this recovery has ironically and not entirely unsurprisingly been a return to higher inflation levels. Perhaps out of fear of the panic and political upheaval that precipitated the economic crises in 1989 and 2000, the Argentinian government has consistently underestimated official levels of inflation since 2007. This is best demonstrated by the average change of prices found online, which has been aggregated by groups like PriceStats; this index shows inflation for 2012 to be ~10% higher than the official figure of 13%. Inflation has become such a hot button issue there that when an interviewer pressed the economy minister on the matter he abruptly ended the interview. But does this high inflation have a relationship with the size of Argentina’s public debt? 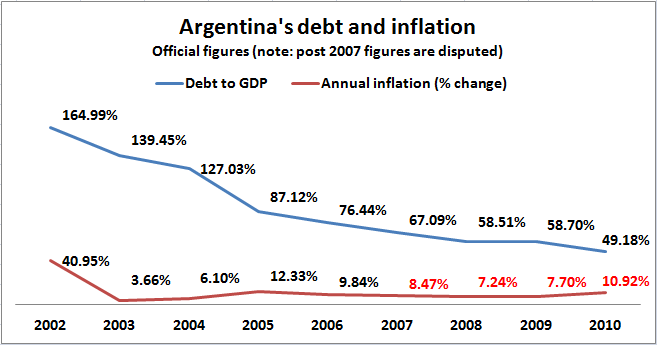 Yet while Argentina’s inflation might not directly correspond with debt levels, there appears to be a connection between the fiscal and monetary policies of president Cristina Fernandez de Kirchner, including her management of the national debt. Perhaps most importantly, by using the central bank’s reserves to fund domestic spending, the government has removed an important guarantor of both currency stability and low inflation by removing the central bank’s independence. At times, writing about these countries felt a little like writing Isaac Asimov’s A Choice of Catastrophes: is the world really this unforgiving when countries accumulate large debt? Judging by these three very different examples you might conclude that we are faced with three awful choices: crushing austerity (Spain), financial repression and deflation (Japan), or runaway inflation and dishonest institutions (Argentina). In truth, these are all extreme examples that I used to drive home a few points. Firstly, if a country’s debt is not denominated in its own currency it runs the risk of defaulting on it’s loans, just like a private borrower runs the same risk. Conversely, it is difficult (perhaps impossible) for a country to default on its debt if it is denominated in its own currency. With this in mind, the risks of high levels of debt to a nation’s economy vary considerably depending on whether a county’s debt is denominated in its own currency or not. For countries with debt in a foreign currency, (the Euro counts in this case) the risk of actual default makes austerity much more likely and therefore the greatest risk of high debt levels comes from these possibilities. For countries with large debts denominated in their own currency the greatest threat to the economy stems from the effects of their own government’s actions directed at controlling the debt. This can come in the form of inflationary policies as in Argentina or in financial repression as Japan has employed. To summarize some points: high debt levels certainly have caused some serious problems for many economies, BUT these problems appear to be much more manageable when the debt issued is under a local currency. And while the high debt levels in the United States and other large economies might appear impossible to repay, equally large debts have been repaid in the past without default or high inflation being part of the outcome. I hope you enjoyed reading this blog as much as I enjoyed writing it, until next time. I don’t really have to translate der Spiegel to get the message across but it says: Why Greece must now leave the Euro. To summarize broadly the narrative that has come out of the press in the past week: European voters have rejected austerity, now the end (of the Euro) is near. I want to go beyond that narrative though, there’s much more behind this “democracy interferes with a solution to the European crisis” than is being reported. So lets start with the election of Socialist François Hollande. The Economist is a publication I hold dear most of the time; usually their articles promote a mostly centrist, albeit pro-globalization view. But there are so many problems with the Op-Ed piece on Hollande that I struggle to find merit in any of it. They malign him for not seeking to trim the size of the French state, while admitting that he seeks a balanced budget. And while they say that he “gets one big thing right” with his criticism of German-let austerity they posit that he isn’t doing it for the right reasons, as if intentions make a difference in modern electoral politics. (I’ll go into more detail on the German austerity program but to avoid being redundant here’s a relink a blog I wrote about it earlier). 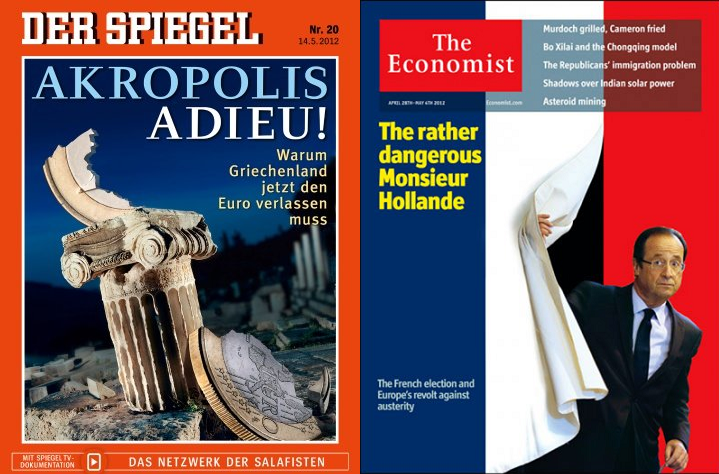 So The Economist was alarmed by the prospect of Hollande winning, what about the markets? 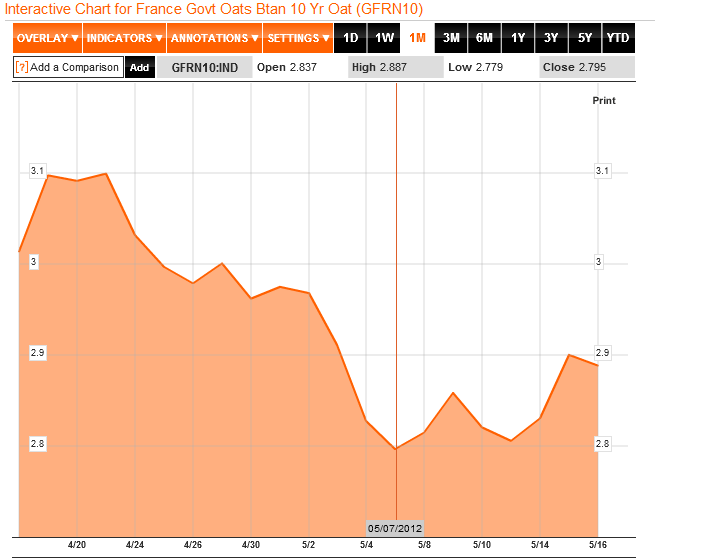 As you can see yields on French 10-year government bonds initially dropped before rising later in the trading week. But even at its current peak French bonds are still more highly valued than they were for most of the end of Nicolas Sarkozy’s term, a less “dangerous” candidate. New Democracy was awarded 50 additional seats for coming in first place, but no party won even 20% of the popular vote in this election. It should also be noted that only PASOK and New Democracy supported continuing the bailout-induced austerity program. After four separate attempts to form a coalition, the parties gave up and planned a new election on June 17th. Current polls have the left wing anti-austerity party Syriza coming in first place with 22% of the vote. While the potential for a Greek government that opposes austerity has rattled the markets, people should be equally concerned over what the response could be from Germany. Angela Merkel telephoned the interim leader of Greece and was reported to have suggested Greece should hold a referendum on its Euro membership, though Germany denies this was proposed. Greece would not be alone in seeing voters reject austerity: Italian local elections also saw supporters of austerity get voted out. And while not facing an election, Spain’s prime minister Mariano Rajoy said that the country would breach the deficit targets imposed by the so-called Fiscal Pact led by Germany. I’d like to expand the often cited “fiscal pact” for a moment here. 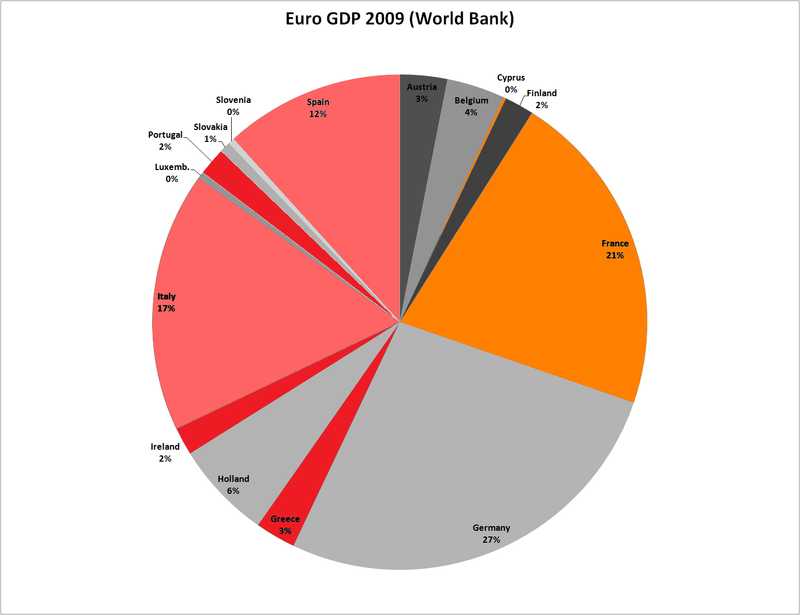 The EU treaty now called the fiscal pact was signed at the beginning of March 2011, it stipulates that signing nations must not run a budget deficit of more than 3% of GDP or they will be fined. The fiscal pact has been maligned by many (Joseph Stiglitz even called it a suicide pact) but the treaty was enacted in order to fix a real problem inside the Eurozone. Unlike the United States, where both our currency (monetary policy) and the national budget (fiscal policy) is set by the federal government, the EU only has direct control over the currency (the Euro). This causes many complications, of these the most well understood has been a competitiveness problem in certain European countries. Countries like Italy and Spain gave up a competitive advantage when they joined the Euro by giving up their cheaper local currencies. A way of offsetting this was to lower the borrowing costs for new members to help eliminate the competitiveness problem without devaluing the Euro currency itself. The problem now is that 10 years after the creation of the Euro, the competitiveness gap still exists. 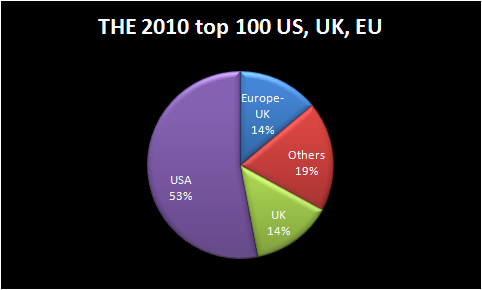 This is not unique to Europe; in the US we also have a competitiveness gap between US states. 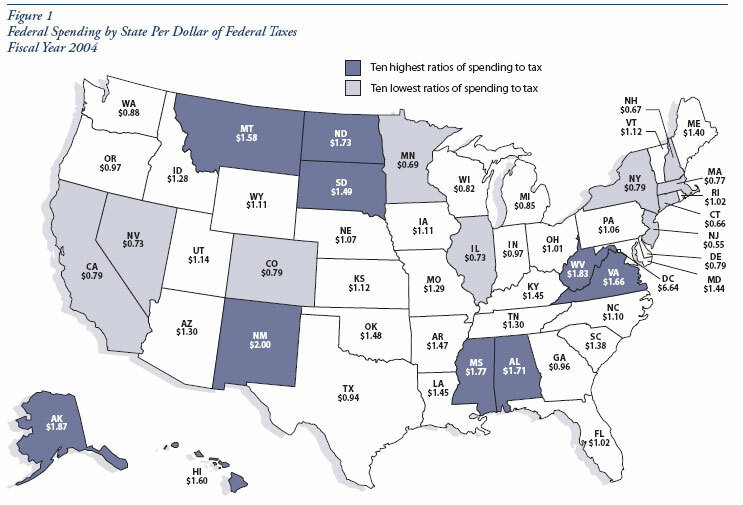 Poorer US states like Kentucky, Mississippi, and West Virginia take in much more than they pay into the IRS, while states like California get considerably less back. This translates into long term transfers of wealth from competitive parts of the country to less competitive ones; Europe lacks this redistributive mechanism. At the same time, because the federal government issues bonds on behalf of all 50 states, the fiscal insolvency of one state (say California) is not exposed to the wrath of the markets. In other words, the risk between US states is mutualized by the federal government. Europe currently lacks both of these tools to stymie the crisis. 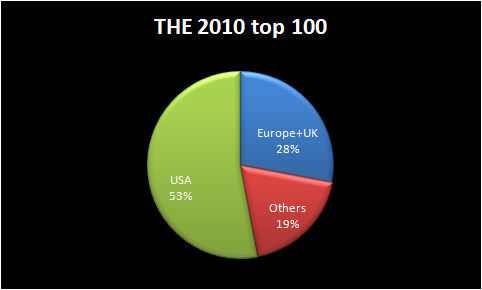 This brings us back to issue of democracy and the European economic crisis. While some countries have voted in opposition to the austerity drive, German voters have their own reservations on many proposed solutions to the crisis. 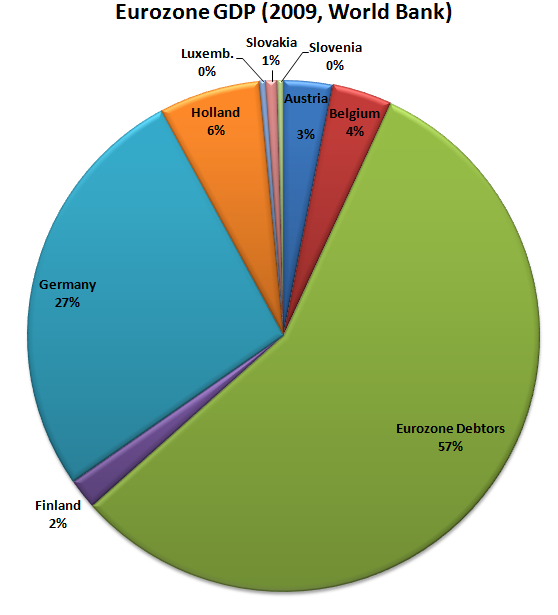 According to a poll in November 2011, 79% of Germans oppose a European Bond that would combine sovereign debt from Germany with other Euro members. Germans are similarly opposed to any inflation outside of what they view as acceptable. A poll from an insurance company (R+V) asked Germans what their most pressing fear was: last year inflation topped the list with 63% of respondents listing it. These views have been reflected by German policymakers as Finance Minister Wolfgang Schaeuble denied that Greek bailouts would result in any transfer union in Europe. German opposition to inflationary policy at the ECB has also been pronounced. While some of this stubbornness has changed over time, policymakers still have an obligation to follow the wishes of their citizens or face potential defeat in elections. 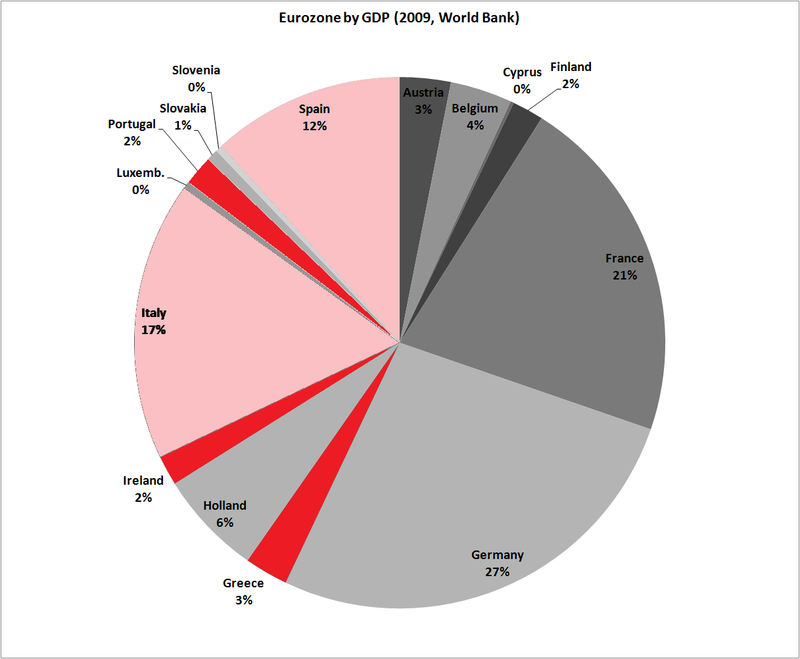 Right now the “strategy” to resolve the Eurozone competitiveness problem involves cutting deficits across the EU and relying on “internal devaluation” caused by austerity and falling prices in the most troubled economies (Greece, Ireland, Portugal, Spain, Italy). Unfortunately this process takes a very long time and has put many of the troubled economies into recession. This process is also complicated by German opposition to inflation, as higher inflation in Germany would help make the troubled periphery more competitive. In the end, the problems affecting the Eurozone will probably require a combination of both austerity measures over time in some countries as well as some form of debt mutualization and fiscal transfers to less competitive countries. 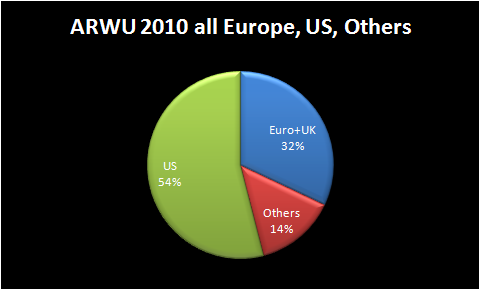 This is, of course, just to stymie the medium to long term imbalances facing the Eurozone. In the short term the EU has very dire questions to answer: is the current strategy sustainable, can the Eurozone survive a Greek exit, would it be worth it to tolerate countries rejecting austerity if the alternative was a disorderly departure from the single currency? Above all, can the Euro survive the challenge democracy presents to resolving its many problems? 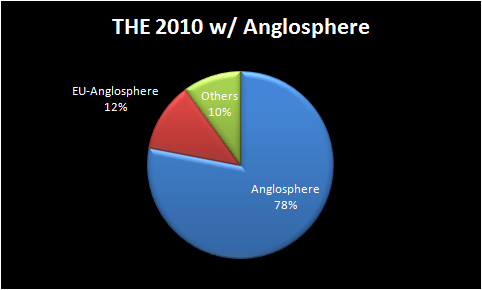 After months of mental stagnation I’ve decided to return to the world of blogging with an extra spergy post on the economic policies being considered on both sides of the Atlantic. Before I expand on this subject I want to send a special thanks to economist bloggers Paul Krugman, Brad DeLong, and Matthew Yglesias for inspiring me. I absolutely don’t belong in the same category as them but I feel so much better informed by their blogs. For anyone looking to learn a little bit more about economics or economic theory I highly recommend following these blogs. For additional perspectives from economists you should also consider the blogs referenced in this compelling economist article. While some time has passed since the debt ceiling standoff and subsequent downgrade by Standard and Poor rocked US markets, the debate remains central to US economic policy. In recent Republican debates austerity has been almost universally endorsed. Governor Rick Perry went so far as to propose eliminating three government agencies, though which three is still up for debate. This stance on austerity has also been endorsed by Republicans in Congress, with multiple proposals to reduce government spending in the short and medium term. In both Europe and the United States austerity has been proposed as a solution to the risk of bond market action on sovereign bonds. I think it is critical to understand a few key elements of what this “bond market action” implies here. When governments seek to borrow money, they auction sovereign bonds denominated in the currency used by those respective governments. Governments then have to pay back those bonds with interest. This interest is called the “yield” and has an inverse relationship to demand for those bonds. So if a bond is in high demand, the yield will be low, while a bond with low demand will have a higher yield. Ratings agencies, which represent the interests of bond-buyers will give ratings on sovereign bonds based on how likely they think they will be repaid. Even though a nation’s sovereign debt rating can be related to its yield, the two don’t always correlate to one another. When the United States lost its AAA rating from Standard and Poor (the other two major ratings agencies kept the AAA for the US) stock markets lost record volume but demand for US sovereign debt actually went up. 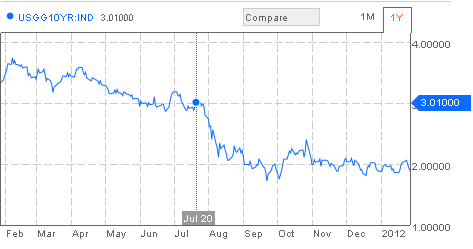 As I write this the yield on US 10-year bonds stands at 1.89%, while it stood at 3.01% on July 20th, 2011. At present, Greece would have to pay 34% interest on a ten year loan. This has effectively locked Greece out of selling its debt. It would seem natural then, that the countries that are now bailing out Greece would insist that Greece cut government spending sharply and try to raise more taxes to cut its deficit. After all, if Greece were able to finance its spending without having to borrow money, yields wouldn’t matter, at least in the immediate term. Germany, the biggest Eurozone economy, has led the push for austerity in Greece and other Euro countries with dangerously high yields (Italy, Spain, Portugal, Ireland have all faced high yields). This is as troubling as this looks, it easily could have been predicted. When you lower spending like Greece has done, you are in effect giving public sector workers/pensioners less money to spend, lowering demand. This weakens economic output across all sectors of the economy, as private businesses adjust to lowered demand by laying off workers and producing less. 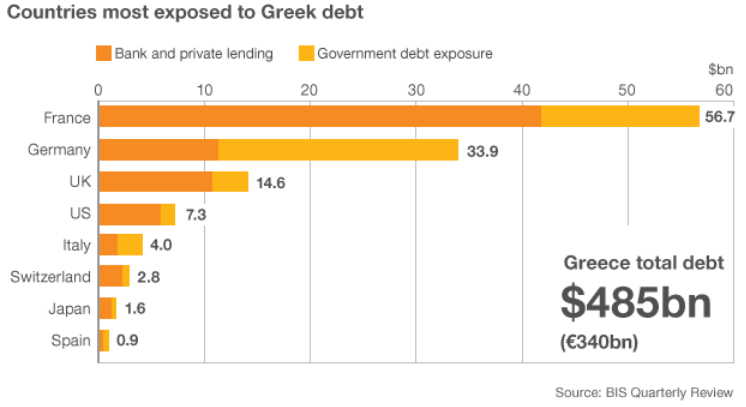 This does more than just damage the livelihoods of Greek citizens, it actually exacerbates the government’s finances. As Greece’s tax base becomes less wealthy, the government must either raise taxes further (which certainly does not stimulate growth) or continue to run a budgetary deficit just to maintain the status quo. 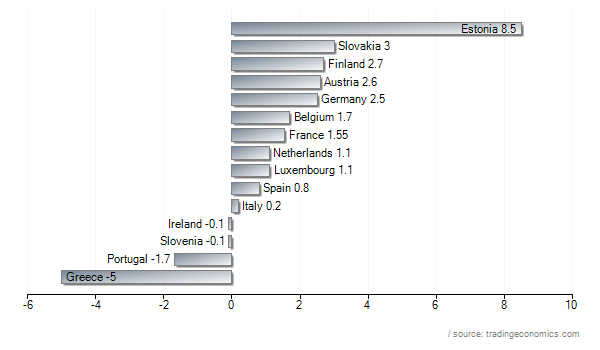 This graph measures annual GDP growth in the Q3 2011, and with the exception of Slovenia, all of the worst performers had to implement some form of austerity in response to high yields/EU intervention. It’s worth noting that Stiglitz had similarly critical things to say about US austerity, pointing out that the US has shed 700,000 public sector jobs over four years. While European austerity has been rightly criticized for its futility, it must be pointed out that Eurozone countries have faced something that the US has not, high yields. One of the most baffling aspects of the aspects of the recent push for austerity across the Atlantic is that, while the US has lost its AAA rating by S&P, its yields have stayed historically low. While it makes little sense for Greece to endure agonizing economic contraction from austerity, it makes considerably less sense for the United States to follow that path. While borrowing costs for the US government are historically low, unemployment remains stubbornly high. It should be both shocking and perplexing that in spite of this Republicans in Congress have held up virtually every piece of expansionary legislation recently proposed. Republicans have been so opposed to promoting growth through legislation that they nearly blocked a tax cut designed to boost growth from being renewed until they came under intense political pressure and relented. On both sides of the Atlantic there has been a drive for austerity that has hitherto done little to calm the markets OR promote growth. And while countries with high yields have faced inevitable pressure to reduce deficits, the real tragedy stems from the lack of leadership from countries with the room for maneuver to lead and coordinate expansionary policies. The political systems in Germany and the United States have both been alarmingly inflexible and wrong-footed in their respective approaches to promoting economic growth and stemming the threat of double dip recession. 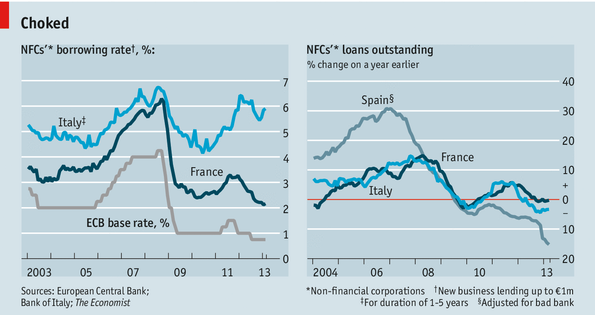 Eurozone contagion part 2: the line between creditor and debtor-states blurred. A crisis that began in the so-called “peripheral” Mediterranean nation of Greece has become a prolonged disaster, that has enveloped countries that are often seen as the “core” of the Eurozone economy. 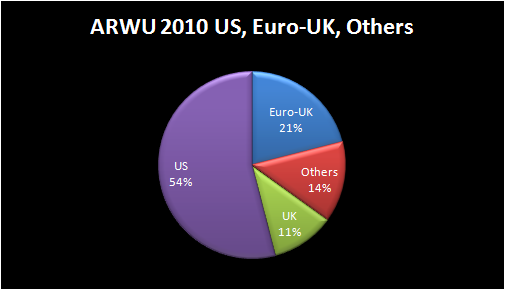 While in my earlier blog I described the bailouts of Greece, Ireland, and Portugal, many things have changed since then. 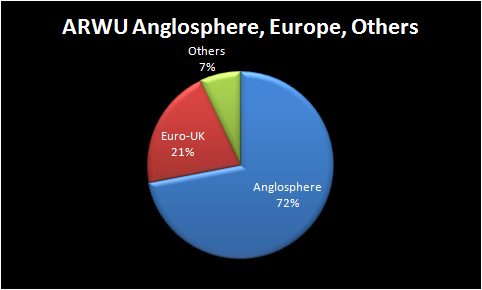 As with the previous blog‘s graph, this shows governments that have been bailed out in red, but now has countries that have been indirectly bailed out (Spain and Italy, via the ECB bond-purchasing scheme) are pink, and countries that might possibly require bailouts in orange. This graph shows that were Cyprus and France to both require bailouts, one could only expect non-bailed out states to meaningfully contribute, making potential creditors the minority of the Eurozone for the first time. This possible scenario might have colored Angela Merkel’s statements at today’s joint press conference with French counterpart Nicolas Sarkozy. She turned down the proposition that the Eurozone issue unique “Euro” bonds that would combine bonds with other Euro states, and instead suggested a requirement for eurozone members to balance their budgets should be enshrined in each of their constitutions. Skeptics have argued that austerity could cause too much immediate pain and could lead to new recessions in Eurozone or elsewhere. This comes at a time when the ECB has also been maligned for raising interest rates despite slow economic growth in most of the Eurozone (only Germany and smaller members saw growth of over 3% 2010). Perhaps skeptics should respect that Germany has long been the engine of economic growth in the Eurozone; its exports far outweigh any European competition. But while growth in Germany was robust in 2010, that has all changed. In this last fiscal quarter Germany grew by a mere 0.1%, causing global shares to drop on the news. This news partially vindicates Angela Merkel’s reluctance to expand bailouts in the Eurozone. 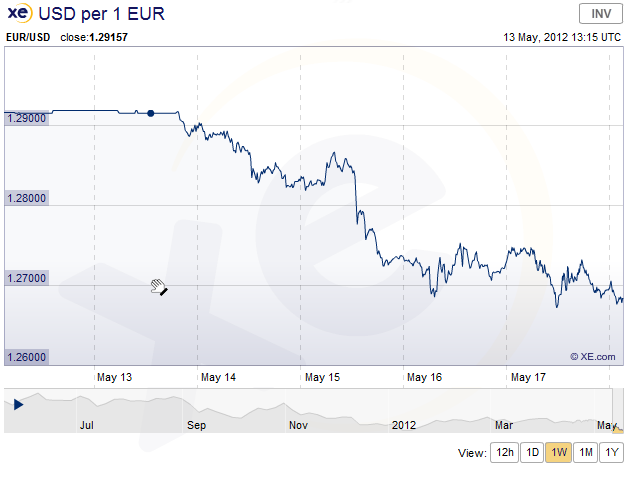 This raises a question: can the Euro currency survive in this dangerous climate? I think its still unlikely that the monetary union will collapse in the near term, despite the dire crises that have recently plagued it. One reason for my confidence is the threat it would pose to any member were it to go alone: Greece might be withering under austerity right now, but were it to reintroduce the Drachma and ignore all the debt it currently owes it would still face a primary deficit (the money it spends cannot be covered by the taxes it collects) and offsetting this with printed money could lead to hyperinflation. Meanwhile, Germany’s current stagnation would pale in comparison to damage to exports caused by Germany’s currency appreciating by 28% vs. the dollar, were it to abandon the Euro. With Germany and the debtor states alike bound to the single currency, the most likely option appears to be a grudging acceptance of further fiscal integration of the Eurozone by creditor states and the simultaneous agreement to endure austerity in the zone’s debtor states. The real question is whether this will be enough to save the currency. UPDATE: to make it clear that the Eurozone is not alone causing financial upheaval I should point out that US is also failing to calm the markets by its own inaction. If the Fed were to take bold steps towards stimulating the US economy as has been demanded, perhaps the Eurozone debt crisis would be more isolated in its disruption. In a recent turn of events holders of sovereign debt from Italy, Ireland, Portugal and Greece have sold off some of it, which has increased the yield (amount of interest these countries will have to pay) on their debt. Italy now has to pay 5.35% interest on its debt, while Greece, Ireland and Portugal now must pay 28%, 16.3% and 18.6% respectively. 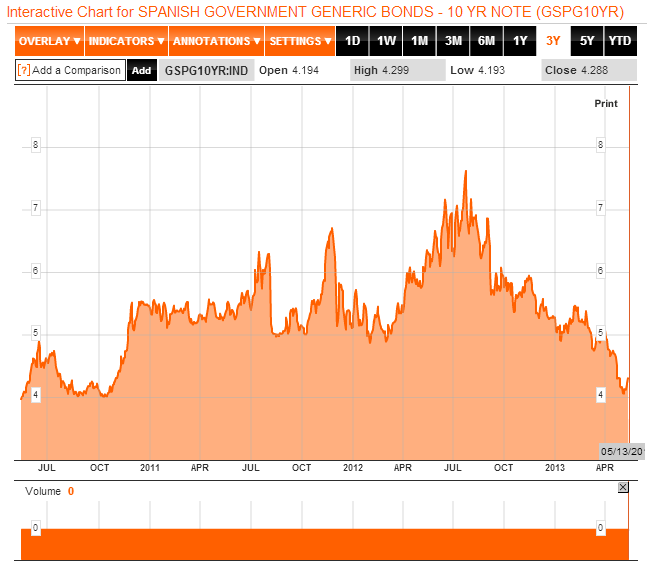 Spain’s debt was not affected by this recent sell-off but has a current yield of 5.65%. 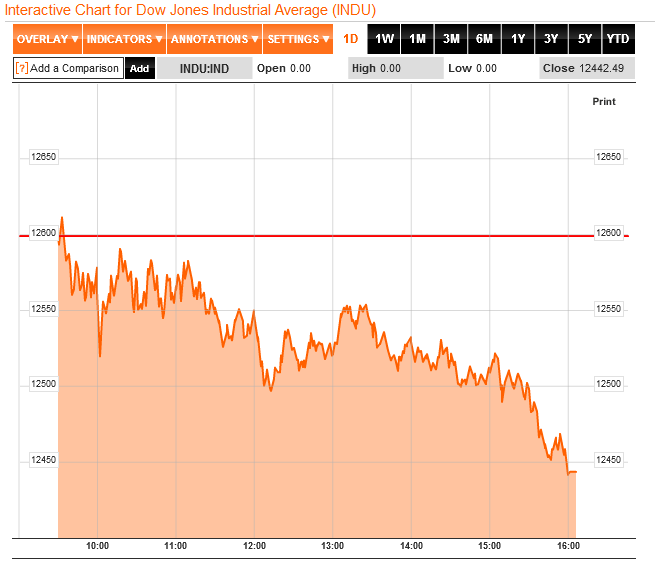 This news is particularly alarming because yield rates had began to stabilize before this recent sell-off. More to the point, Italy (and already struggling Spain) are much more important to the economy of the Eurozone than Ireland, Greece, or Portugal.